Well.... it wouldn't be January without them would it? Lets just hope I put them into practice for the 365 days or more and not just a fortnight! Some are blog related and some are just life related and I'm sure some are probably repeats of last year too, opps haha! I'm sure most of us are going to have this on our lists. I'm forever up and down with my weight and dieting on and off has become the norm for the last 3 years or so. This year I am super determined to get that body I've always dreamed of and finally be fully confident with myself, as well as ditching lots of the crappy foods that seem to run my life! Just look at Charlotte Crosby - I can do that too! I'm nearly 25 which means I should know how to be a tidy human being by now. Goodbye clutter, hello organised home! It's about time I got out there and said yes more. Whether it's a blog event or dinner with friends - Kirstie saying yes is going to happen more! I moan far too much and really what do I have to moan about? My weight? My job? I can change all that myself so I'm going to try and see things in a positive light and really appreciate how lucky I really am in this world. 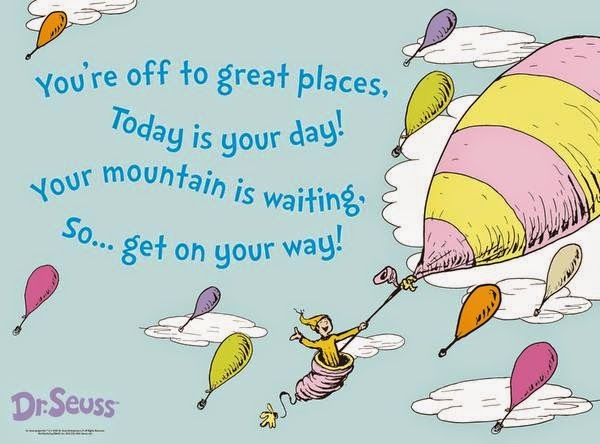 Well I was going to say "read more" but that was definitely on my list for 2014! I started this series months and months ago and even though I bought all 6 books on my kindle I'm STILL only on book 2 - so this year I WILL finish them! Every year since turning 18 I've said I'd get a tattoo. I have a few ideas in mind so I just need to decide on one and go for it! Yolo! This year I have done a whopping 322 blog posts - to me that is alot. I ended up doing a blog post every single day for most of the year and I have to say it was a serious challenge at some points. Don't get me wrong I loved it but some days I feel like I put way too much pressure on myself to get things done! In 2015 I want to focus more on the quality of the post rather than how many I do! I love blogging and it has become a real passion of mine but I have been really scrapping through with the stuff I have been using to keep it going. I cannot wait to invest in a new camera, some lighting and hopefully eventually a mac. I have recently bought a new laptop to replace the awful netbook I have been working with for the past year - the first step to help me improve A Yellow Brick Blog! Yes I started uploading videos to Youtube this year after years and years of self-doubt but in 2015 I really want to put more effort into it! The amount I watch others on youtube makes me so motivated and determined to do it myself and improve my videos... because at the moment they are pretty pants! Whatever your plans this NYE, it's New Years so you've got to be having fun! Whether your off to an extravagant party, spending the evening in your local or having a fun night in with the girls - I'm sure you're all planning your nights already! Night out vs Night in - what do you have planned? I still can't decide! Hello you lovely festive lot! It is finally day 24 in The Body Shop's Christmas Blogger Advent Calender for 2014 which means 1. it is ME and 2. it is Christmas Eve!!! I cannot believe it's Christmas tomorrow and I also can't believe I got picked to be such an awesome day. So, get those festive socks on, get munching on a mince pie and check out what I have to say on some of The Body Shop's top picks for Christmas! 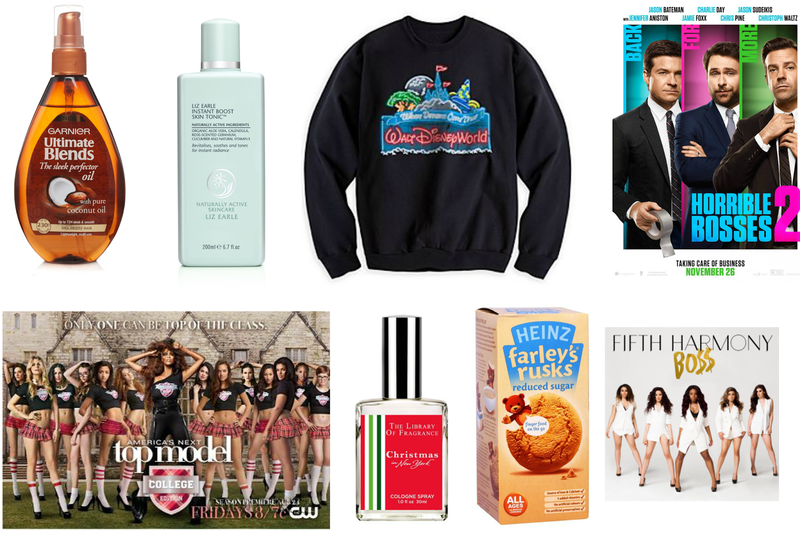 Christmas 2014 at The Body Shop is all about making wishes come true (I'm a huge Disney fan so the sound of this just makes me happy) and the guys at TBS are confident that you'll be able to find everything you need to delight your loved ones this year. And I must say I was definitely happy with this duo I received. The Body Shop are amazing, full stop. Since becoming a 'blogger' my love for them has been totally rekindled and I am officially obsessed once again! My wishlist for TBS is as long as my arm at the moment, I could spend hours looking through their website! The products I will be reviewing today are from the white musk smoky rose collection - which is a totally new collection to me. First up the Eau De Toilette! I was so pleasantly surprised by how lovely the scent is! Not as strong and 'pokey' than I was expecting, a subtle sweet floral smell which smells like something you'd get behind the perfume counter at Boots! Even though it isn't the parfum version the smell is still strong and lasts a long time for what it is! This is something I'd wear everyday to work and priced at only £11 for a 30ml or £16 for a 60ml this is a perfect bargain. Again the shower gel has the same sweet floral but non-overpowering smell that I mentioned before. If you like the smell of the spays then this is perfect to keep the scent on your skin for even longer! Using the shower gel alongside the fragrance is a great way to layer the smell on yourself which helps keep it stronger for longer! This 250ml is £6.50, a little more expensive than my everyday Sanex shower gel but a lovely product to have as a treat a couple of times a week! I have loved being involved in this awesome advent calender of posts, especially with being alongside some amazing bloggers who I read and admire....alot! So thank you very much to the lovely people at The Body Shop for the opportunity to get involved and make sure you check out all the other lovely ladies who are hiding behind those advent doors. AND it doesn't stop there! For more festive fun with The Body Shop why not check out the brilliant video below featuring none other than UK vlogger legend (and other half of queen Tanya Burr) Jim Chapman! I'm definitely going to be heading to their January sale to stock up! I've seen a few people doing these over the past week or so I thought why not share my favourite blogs from the last 12 months! I have soooo many favourites that I thought I was narrow it down to just 12 (one for each month right?!) and put them into 4 different category's - Inspiration, Informative, Fashion & Personality. Blogs that I look at in awe, their layouts, their writing, their photographs - I love what these girls do, some of my ultimate favourites! 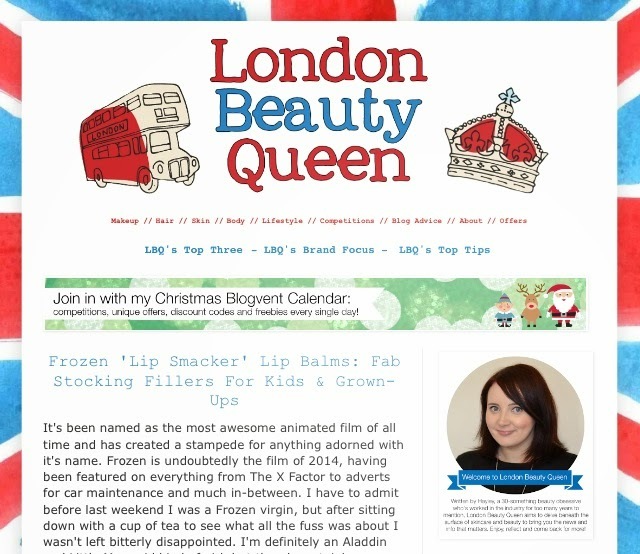 Liza is one of the first bloggers I started chatting to when I started A Yellow Brick Blog back in 2013! Since then she has constantly been an amazing friend and helping hand! Her blog is hands down one of my favourites! The fact she runs it whilst also running her amazing youtube chaneel, working and being a Mummy is just incredible! I'm always obsessed with her photography and her looks are perfection! This is the blog I head to when I want to read about a bit of glam! Kayleigh always seems to be on point with everything fabulous! I love her reviews and her photos are always perfectly thought out and the main focus of the post - I love that! Plus her OOTD's and Instagram are awesome too! Another blog in which I just sit and stare at the photos are think .... wow! Becky's reviews are always so informative and honest and I love the way she writes! She has that classic blogger knack of making me want to invest in everything she talks about! 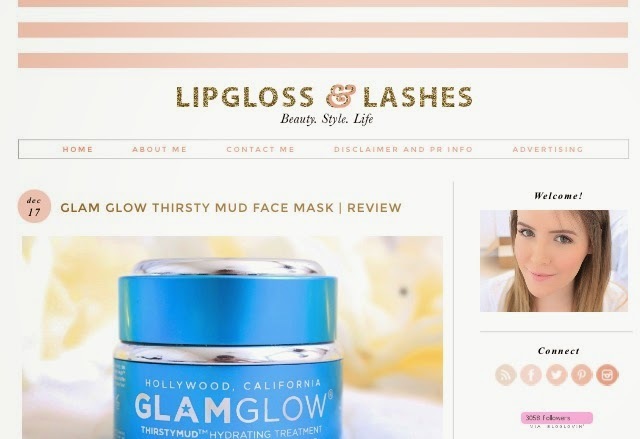 Lipgloss and Lashes is also now on youtube so make sure you check her out! Need a review on a product? Want some facts on things? - one of these girls is sure to have it! Bursting with products all-day-everyday, they are my first stops when checking out the newest stuff on the market or if I need a helpful review to read. I fell in love with Ree's blog after stumbling across it at work one day. I was googling a new product I wanted to find out more about and up came this blog with so much information and some great photos! If you want to check things out before they've even been released - this is the place to go! Ree seems like such a genuine lovely lady, I hope one day I can create something as brilliant as her! 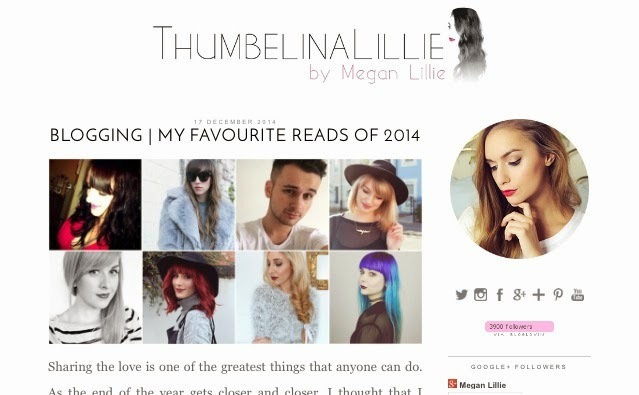 Another blog which is totally jammed packed with posts day in day out and look how pretty the header is! 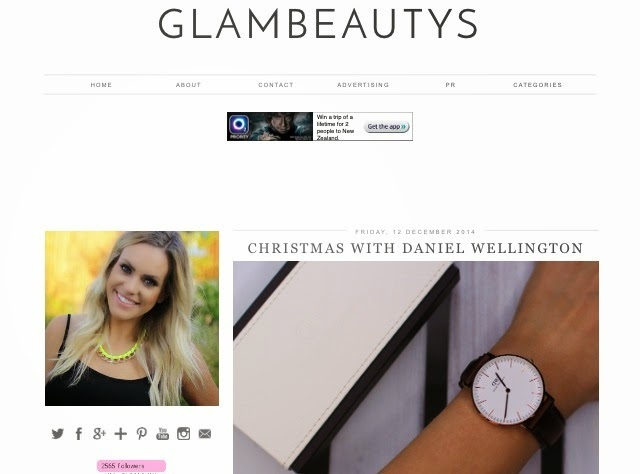 I love coming to Gemma's blog after a few days and catching up with the exciting new products she has to flaut! Gemma also has an amazing personality, I love chatting to her - some conversations recently have had me in fits of laughter! 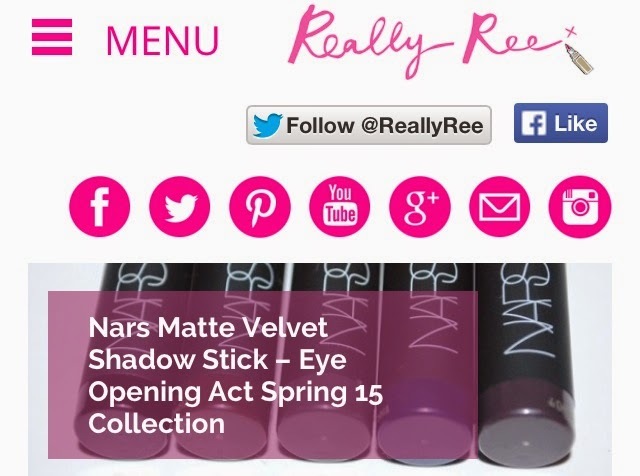 The perfect place to start if you are new to beauty blogs! Hayley has the perfect variety of beauty posts and she is another person I always go to on a weekly basis for a good old catch up! 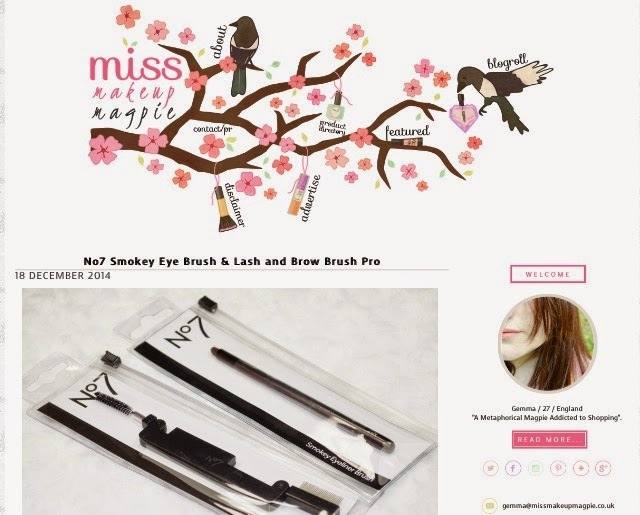 There's always so much to read and I find her blog great for finding new products to try out! Her reviews and posts are some of the most honest out there and I really trust her! This girl has had an awesome year hasn't she? I love Megan, she is hands down one of the sweetest bloggers I'm lucky enough to chat too and her blog has been one of my favourites since finding it last year! Her style is adorable, she wears everything I couldn't! Her beauty reviews and YT videos are always a hit too - make sure you go and check out this petite little princess! I have no idea why this photo above has come out so much greyer than the others - stupid phone! Charlotte is that fellow IOWer I was talking about! She has literally taken the blogging and social media world by storm these past 12 months and if you are looking for some outfit inspiration then she girl for you! She has amazing personal style and creates window-display-worthy outfits every single post! Her love for Katy Perry, animals and Evan Peters aswell makes me like her even more! Silly iPhone couldn't change this too a desktop site display darn it - I'm sorry! I can guarantee most of you have either already checked out Victoria and/or are following her already! This purple haired beauty (major hair envy alert!) 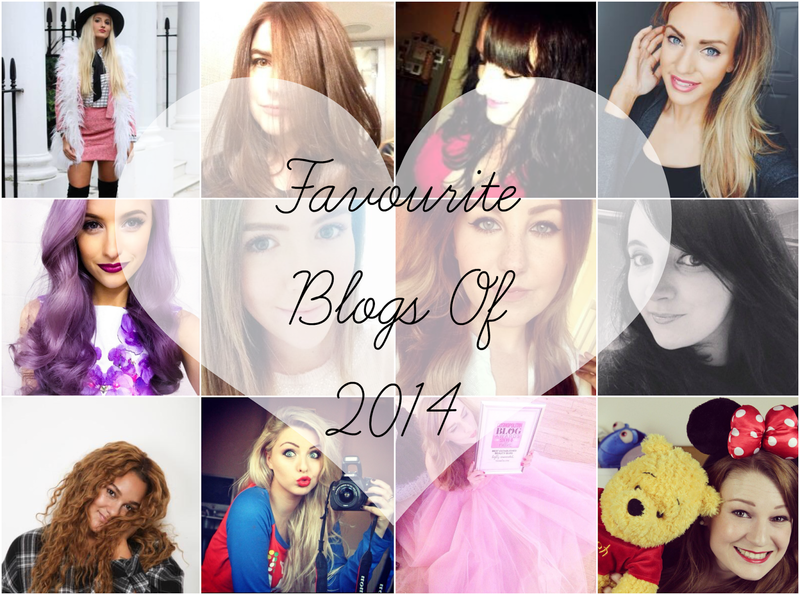 has the most amazing blog and youtube which are visually just a dream! Her outfits always look incredible and her personal style is to die for! Her beauty reviews are some of my favourites to read and her blog is probably the one I venture to most! These girls are total babes - from their writing on their blogs, to their tweets on twitter to their amazing mugs on youtube. I love their personalities, we should totes me friends girls! Kate's blog and range of social medias always make me smile and her youtube videos are some of my favourites to sit back and watch! Our chats always cheer me up and ti makes me laugh how much our minds are the same sometimes haha! Go and click SugarfixxBeauty now! 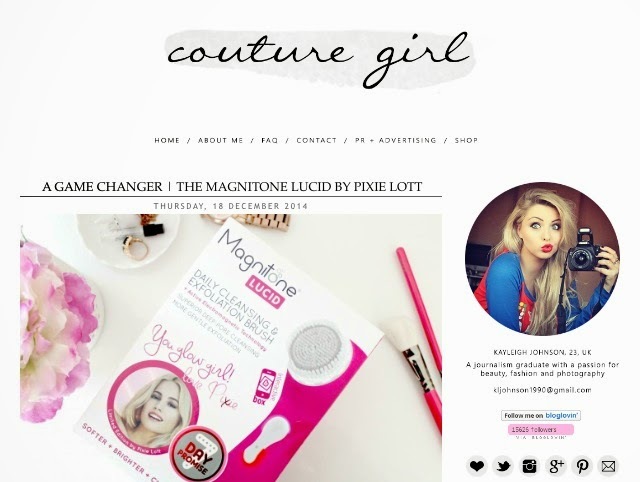 Gracie's blog is a fantastic range of fashion, life, beauty and love and I am so glad she has ventured into world of blogging! Her posts are always really positive and her writing is fantastic, she has such an amazing confidence about her! Such a genuine sweetheart, I love the effort she puts into my her posts as well as her videos on YT, Gracie is a fab role model! Did someone say fellow Disney lover? 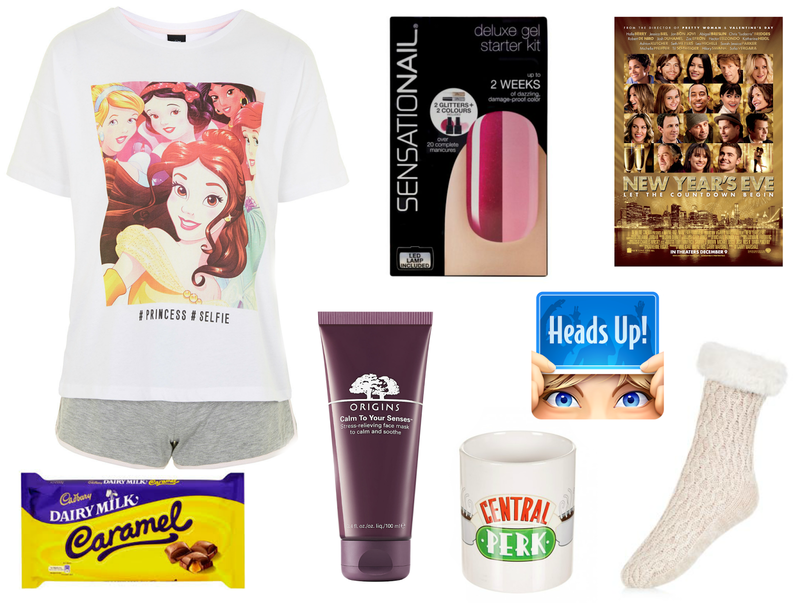 Anyone who loves a bit of Disney is going to be in my good books really aren't they? Charlotte's upbeat and happy writing always has me smiling - I mean just look how happy her blog looks above! Who are your favourites from this year? Any of the above? It's Christmas in a matter of days and you know what that means.... glitter and sparkle everywhere! Everywhere..... including our nails! 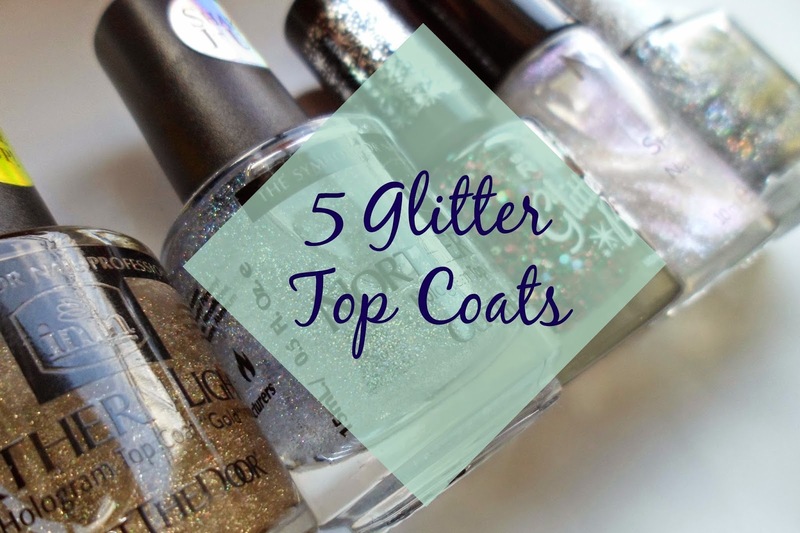 I love a bit of sparkle a this time of year and these are some of my favourite top coats to rock! Every single year I always buy more like these, I'm a sucker for sparkle and so many brands bring out new ones each Christmas I just can't help myself! The first two coats are the northern lights duo which are fab! These were sent to be recently by INM and they are great! A really subtle but gorgeous sheen which give a great sparkle in the light! They make my crap nails look a little bit more sassy and with painting my nails alot less recently in an attempt to help them grow, this coat is great to keep them strong and shiny! I've been trying them over the top of loads of shades and they definitely look the best over a black! Love love love, but I still can't choose between them which one is my fav - keep your eyes on my twitter/insta for more photos! More info - here ... gold/silver. Middle coat is a new one in my collection which I actually received from Emma in my Christmas Beauty Box Swap! If Christmas could be summed up in a a nail polish this Rimmel beaut would be it really! Red and green glitter in a nutshell - I was so chuffed to see this in the box as I hadn't actually seen this one before in the shops! Last is a Barry M polish from last year which I still wear all the time - no matter no time of year it is! Barry M always have great Limited Edition glitter shades at Christmas time, usually one or two for both Superdrug and Boots! This is a classic silver glitter, perfect for everyones collection! One of my New Year's resolutions is too keep better care of my nails, having extensions for so long did wreck them a bit, so strong, long nails here I come! Since my Morrocanoil has run out and I'm way too poor to buy anymore I have been using this hair oil alot more. I bought this originally as I saw Gabby (VelvetGh0st) raving about it in one of her favourites videos! I love this stuff, it smells amazing, keeps my ends feeling soft and decreases frizzyness in my crazy mane! I use this stuff every morning and every evening and without it I feel lost! I definitely rely on this tonic to keep my skin feeling fresh and clean! It is the perfect product post make-up removal and I haven't yet found anything like it that works as well. I got this in Florida back in September and I love it so much. I love getting home after work in the winter and cosying up in a sweater and pj bottoms! I have been wearing this and my Planet Hollywood sweater constatnly, they are so warm and comfortable! My friend Megan & I went and saw this last week and we literally laughed from start to finish. At some point I remember putting my hand over my mouth as I was being so so loud..... luckily there was only about 4 other people in the screen with us! A great sequel.... and Jennifer Aniston is still as hot as ever! Finding America's Next To Model on a certain forgein Netflix was both a blessing and a curse. I have been obsessed with this show ever since it started but I had missed the last couple of cycles. So when I spotted it on there I knew that the rest of my week was occupied. I'm as hooked as ever, I love Tyra so much. You may have already seen my review of this but I had to include it in this post! I love Christmas and this scent makes me feel so jolly! To read more about it click here to see my review. Okay.... random purchase alert! I decided to pick these up last week when I saw they were on offer, I remember them being so yummy when I was a kid and I thought they'd be better for me than the million biscuits I decided to eat weekly! They are still so yummy but... don't dunk them in your tea - they aren't strong enough to cope with it! I loved these girls on The X Factor USA and was so pleased to see them on the UK show last week! This song is awesome, I've had it on repeat along with their song Sledgehammer all week - they remind me of a mini Pussycat Dolls, which is definitely a band that we need right now! What are your thoughts on this new post series 'This Week I'm Loving...'? It may not be every week but I find it fun to share other things I'm enjoying not just products and beauty tips and tricks! 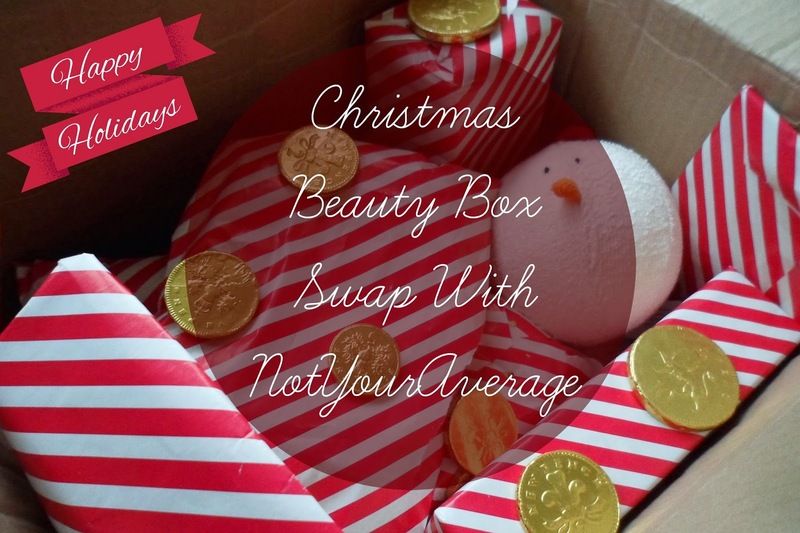 A couple of months ago me and the lovely Emma from notyouraverage decided to create a little Christmas box swap for each other! There's wasn't much interest for a secret santa this year with other bloggers (due to some not so great experiences for some people last year) so we thought we would just do something between just the two of us! So the day finally came last Tuesday where we had both recieved our boxes so we decided to sit down that evening and do a live opening on twitter..... hands up if you saw it! It was so fun communicating with each other whilst opening each present, I actually loved it! 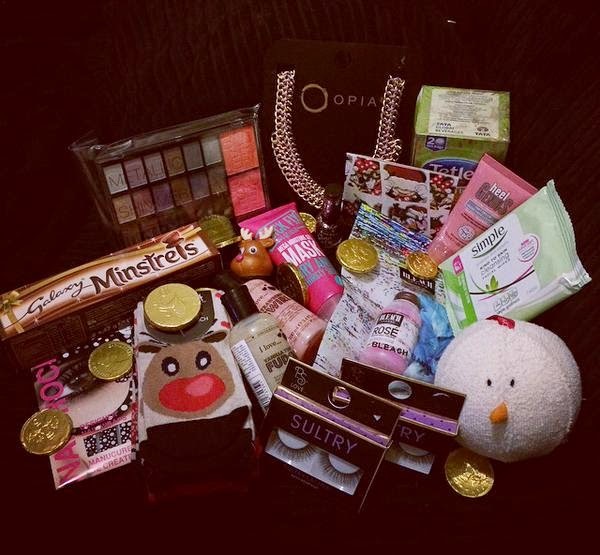 I was so so pleased with everything that Emma got me and I loved the box swap experience... I really hope she feels the same way! These black and white polka dot nail wraps are so cute! My nails are pants so anything that can make them a bit better without damaging is all good with me! I'm currently trying to strengthen and grow them so as son as they are in better condition I'm going to try these out! I love love love the mix of all the different types of shadow in this palette! With metallics, shimmers and mattes this is the perfect mix for me plus you can two lovely shades of blush too! This little packet is perfect for my handbag and for nights away from home... I think I may save these for when I go away to Germany soon! I have been eyeing up this brand in Boots for a long while now and was so chuffed to see it in the box! I can't wait to finally give it a go, I'm such a face mask hoe - I can't get enough! You can't beat a bit of chocolate at Christmas time.... and I'm not going to lie, most of this has already been devoured! I love love love green tea, it is my fvourite, so I was really touched that Emma had made this box so personal! I've tried this and really really like it, I'm not normally a fruity person but this is nice! These. smell. amazing. - yumyumyum! You can't have a Christmas without some new festive socks! These are the cutest, I'm so excited to wear them! I love that I also included socks for Emma too! Obsessed! Love it, I love the festive gold with the pastel colours, this will look super cute with a knitted sweater! This was the first present I saw as it wasn't wrapped up, I am such a fan of The Body Shop and this was a lovely idea for a pressie! I've used this foot cream for years now so was really happy to unwrap it! Emma has told me that these are her fav lashes ever so I'm really looking forward to trying that out! I'm an idiot and forget to include the cutest nail polish that Emma bought me! It's a pretty glitter top coat with reds and green - amazingly Christmassy, keep your eyes peeled as I'm sure it will be featured on here soon! THANK YOU SO MUCH EMMA!! Honestly, this was such a fun experience and I'm so glad we did it! Make sure you guys go and check out notyouraverage.co.uk - you may even get to see what I bought her!